Smycken och andra produkter gjorda i guld och silver måste stämplas med en stämpel som anger deras ”finhalt”. Den vanligaste silverlegeringen (legering = blandning av metaller) i smyckessilver är ”925”, mer känt som ”Sterling Silver”. 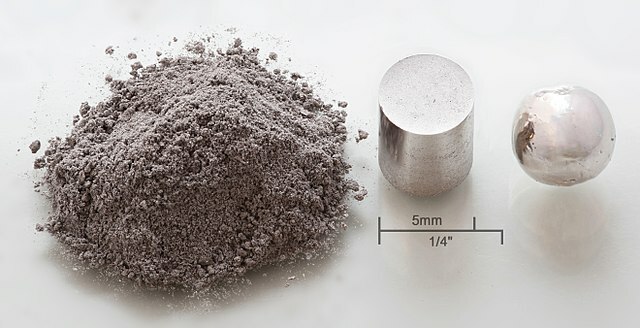 Det stämplas med , vilket står för 925/1000 silver (92,5%). Den vanligaste guldlegeringen är 18K, vilket står för 18/24 guld. Den stämplas med [18K] eller  för 750/1000 silver (75%). I de flesta fallen är produkterna också stämplade med en så kallad ”ansvarsstämpel” som är registrerad hos Svedac, och tillhör det producerande företaget eller den ansvariga guldsmeden. När en producent sätter sin ansvarsstämpel på ett smycke garanterar hen finhalten i smycket. Ansvarsstämpel är ett laga krav i de flesta länder. Ansvarsstämpelm och finhaltstämpeln är din guide så du kan veta att du får det du betalar för. Håll ögonen öppna efter ansvarsstämpeln [PL], det är vår stämpel. Jewelry and other products made in gold and silver are marked according to their content of precious metal. The most common silver alloy (alloy is a mix of different metals) in jewelry making is ”925”, more commonly known as ”Sterling Silver”. It is marked with , which stands for 925/1000 silver (92.5%). The most common gold alloy is 18K which stands for 18/24 parts gold. It is marked either [18K] or  for 750/1000 parts gold (75%). In most cases they are also ”hallmarked” with the brand specific stamp of the goldsmith responsible for the production of the product in question. Gold has to hallmarked by law in most countries. The hallmark and the metal content stamps are your guide to know you are getting what you are paying for. Keep a lookout for the [PL] hallmark. What is considered the largest, purest diamond ever found, a 102 carat brilliant cut diamond is up for auction on Sotheby’s London. It’s anticipated to reach a price of more than $30M. But what makes it so rare? 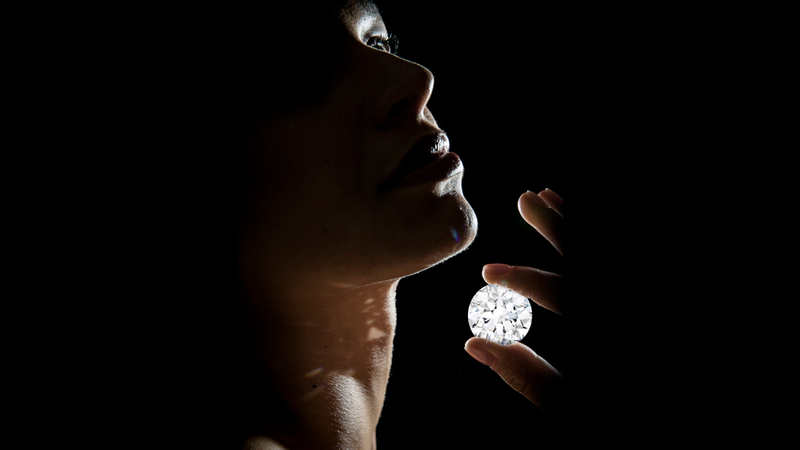 For a starter, only 7 stones over 100 carats with colour grade “D” has been brought to action, ever..
D is the highest classification of diamond colour and makes it extraordinarily white. The cut of the stone took 6 months, and the combination of symmetry, colour and the fact that it is both externally and internally flawless makes it extremely unusual. The diamond falls under a category know as 11a, where only 2% of all diamonds falls. Then, like a cherry on top, this is the only D-coloured brilliant cut diamond over 100ct ever to be auctioned. Is this not the perfect gift for your wife or girlfriend for Valentines? She’s worth it, right? 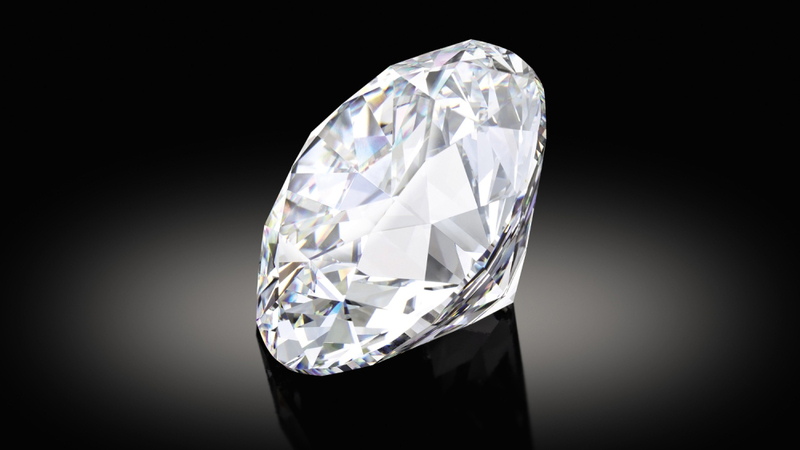 Vad som anses vara den största, renaste diamanten någonsin hittad, en 102 karats briljantslipad diamant, ligger ute till auktion nu hos Sotheby’s London. Den spås gå för över 255 miljoner kronor. Men hur kan den vara så sällsynt? Till att börja med har bara 7 stenar över 100 karat med färggrad ”D” sålts på auktion… Någonsin..
D är den högsta klassningen på diamanters färg, och innebär att den är mycket sällsynt vit. Slipningen av stenen tog 6 månader, och kombinationen av symmetrin i slipningen, färgen, och det faktum att den är ”Flawless” (helt utan ytfel och inneslutningar) gör den extremt ovanlig. Diamanten hamnar i en kategori som heter 11a, där bara 2% av alla diamanter platsar. Sedan, som en slags grädde på moset är detta den enda helvita (Färggrad D) rundslipade diamanten över 100 karat någonsin. Perfekt som present till frun eller flickvännen på alla hjärtans dag. Det är hon ju värd, eller hur?! My husband Chris and I have been looking forward to our spring black bear hunt for a year. Last year I ended up hunting my spring bear on June 30th and while a fantastic experience, there was more heat and bugs than we cared for – it made it difficult to properly skin the animal in the woods, and more of a challenge when dealing with the meat and hide at 30C. We prepared for the spring black bear hunt this year and knew it was going to be an even better experience from last year. 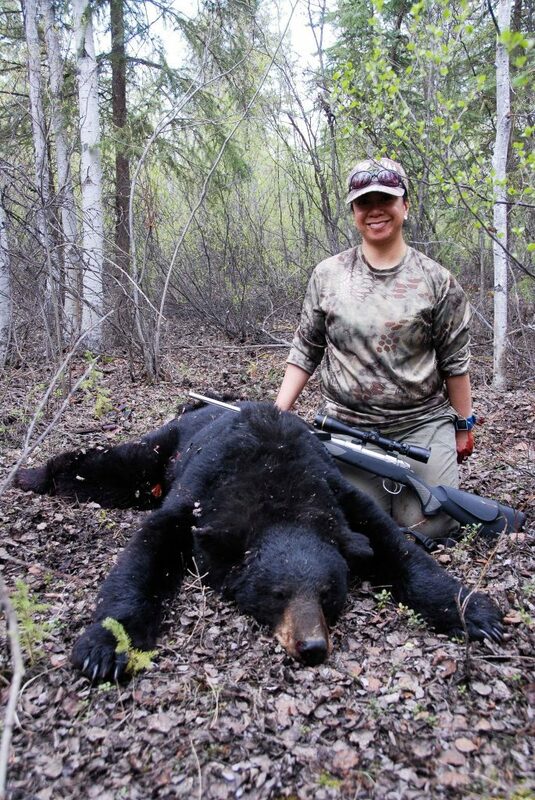 Black bears harvested in the spring are our favourite. They wake up in the Northwest Territories in early May, and just start coming out and gorging on the few food sources available. The berries aren’t out yet – so it’s mainly grasses and tree buds. They gorge themselves, breaking the ache of the winter starvation and getting their digestive tracts moving again. Due to this there are many benefits for us – the hide is the thickest and best quality – made to survive an Subarctic winter at -45C, the fat is the lowest of the year (they spend the next 6 months building those fat reserves up), and the meat is pure, lean, and easy to process. Not to mention it tastes great. Properly hunted spring bear meat for us tastes like – bear. Black bear meat is a mixture between beef and pork with zero fat. It’s not gamey at all, and doesn’t have a “dry” texture/taste to it the way caribou tastes. May 2016 has been stunning this year in the Northwest Territories – low winds, great blue skies, and warm sunlight with cool breezes. We went hunting on a Monday morning for this bear – getting up at 4am and heading out to get them as they have their quiet morning feeding time. We first spotted the bear at 300 yards and it was busy feeding on what we later found out was heavily damaged young trees and tree buds. This black bear had literally ripped trees up to a few inches thick in half, and had a bunch of buds within reach and was having a vegetarian feast. At first sight we knew we had our bear. We sprung to action within seconds. I worked my way up to within 100 yards. Crouched down my rifle in hand, and Chris was off to the side using a predator call to distract the bear. Since I was wearing full Kryptek camo – this bear had trouble seeing me for sure. Black bears aren’t known for their sight, and we had a nice light breeze keeping my scent away from the bear too. I shouldered the rifle I’d been using for a few years now – a Sako 85 Finnlight in .308. It’s a good all-around setup for me as it’s solid and accurate, and can be carried around in the woods from 30C to -40C. The large bear had given me a broadside – I let a round go and the bear shuddered and immediately bolted into the dense brush about 40ft into the aspen woods that the bear was eating buds from. This brush was thick and impassable in parts. Should we have fetched the dogs? I stood with Chris in the area where the bear was shot and we listened. At least twice we heard something, we were both trying play back what just happened and figure out our next steps. For instance, we had our cattle dog waiting in the vehicle, is this the type of stalk where we need to bring her along? Her nose and sixth sense could be an asset like they were last year. As things settled down, we felt like we could do a normal stalk just the two of us, so we started to head further into the woods, making our way through the thick brush. We walked slowly moving 20ft covering each other and then stopped and listened. Everything was quiet except for the gentle breeze that was blowing through the canopy above. After a few minutes of slow stalking, I spotted the blood trail, a bright blood trail that led us slowly into the woods. We took our time, and the next 20 minutes felt like an hour. Am I safe? Is it dead? Suddenly we spotted the bear – a dark figure through the trees about 40ft away. This is always a tense part of bear hunting in the NWT. Finding a bear that outweighs you in the middle of the woods always begs the immediate question or two. Are you safe and is the animal dead? Is this the only bear in the woods? It always pays to be careful. We both crouched down and looked through the dense foliage with our scopes. As the time slowly passed we watched for movement and were also ready to shoot at a moment’s notice. After waiting for a few minutes we finally approached the bear, admiring the thick black coat, heavy limbs and monstrous head. Over six feet long and 300lbs, it was a large quality bear that was built like a tank. This black bear was a mature boar, a fighter, with a scar on the nose and one of the ears half-bitten off. I just imagined the fight this bear had been in that resulted in one of its big ears to be damaged like that. This black bear boar was the biggest one we have harvested here in the Northwest Territories. We always approach our animals with respect, and thank them for giving themselves to us. We love all aspects hunting and for Chris and I, it is a tradition and it is a skill. Our hunt includes carefully picking an animal that will give us good meat and a hide, and it includes carefully skinning the animal so the quality remains. And finally, it is the hours upon hours back home where we process the meat and package it so everything remains high quality and feeds us for many months to come. 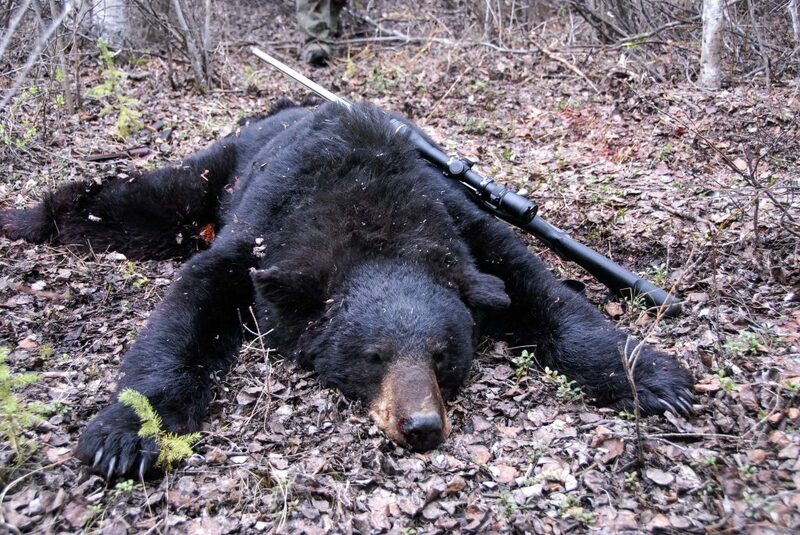 Black bears harvested in the spring are our favourite. They wake up in the Northwest Territories in early May, and just start coming out and gorging on the few food sources available. The berries aren’t out yet – so it’s mainly grasses and tree buds. They gorge themselves, breaking the ache of the winter starvation and getting their digestive tracts moving again. Due to this there are many benefits for us – the hide is the thickest and best quality – made to survive an Subarctic winter at -45C, the fat is the lowest of the year (they spend the next 6 months building those fat reserves up), and the meat is pure, lean, and easy to process. Not to mention it tastes great. Properly hunted spring bear meat for us tastes like – bear. Black bear meat is a mixture between beef and pork with zero fat. It’s not gamey at all, and doesn’t have a “dry” texture/taste to it the way caribou tastes. We first spotted the bear at 300 yards. It was busy feeding on what we later found out was heavily damaged young trees and tree buds. This black bear had literally ripped trees up to a few inches thick in half, and had a bunch of buds within reach and was having a vegetarian feast. At first sight we knew we had our bear. We sprung to action within seconds. I worked my way up to within 100 yards. Crouched down my rifle in hand, and Chris was off to the side using a predator call to distract the bear. Since I was wearing full Kryptek camo – this bear had trouble seeing me for sure. Black bears aren’t known for their sight, and we had a nice light breeze keeping my scent away from the bear too. I shouldered the rifle I’d been using for a few years now – a Sako 85 Finnlight in .308. It’s a good all-around setup for me as it’s solid and accurate. It can be carried around in the woods from 30C to -40C. As the time slowly passed we watched for movement and were also ready to shoot at a moment’s notice. After waiting for a few minutes we finally approached the bear. We admired the thick black coat, heavy limbs and monstrous head. Over six feet long and 300lbs, it was a large quality bear that was built like a tank. This black bear was a mature boar. A fighter, with a scar on the nose and maybe most noticeably, one of the ears half-bitten off. I just imagined the fight this bear might had been in that resulted in one of its big ears to be damaged like that.This black bear boar was the biggest one we have harvested here in the Northwest Territories. We always approach our animals with respect, and thank them for giving themselves to us. We love all aspects hunting and for Chris and I, it is a tradition and it is a skill. Our hunt includes carefully picking an animal that will give us good meat and a hide. It includes carefully skinning the animal so the quality remains. And finally, it is the hours upon hours back home. Where we process the meat and package it so everything remains high quality. It feeds us for many months to come. We are already looking forward our next spring black bear hunt!